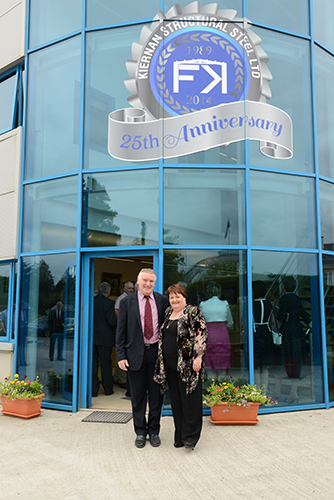 From the bottom up, Frank and Dolores Kiernan have built their successful business. 25 years ago, Frank and Dolores Kiernan saw their world fall apart when they were both made redundant. Frank had worked in the steel erection business and Dolores in accounting and book-keeping. When their efforts of finding alternative employment failed, the couple were left facing a bleak future. Instead, they embarked on a journey to form their own business. And in 1989, Kiernan Structural Steel was created. Today, ready to mark their 25th year anniversary, they have much to celebrate. From what started out as a way to create jobs for themselves has now grown into a hugely successful business that has over 100 employees and an annual turnover of €13m in 2012. Even after 25 years, they have not lost any of their enthusiasm for the business. Inside their modern factory large CNC operated machines cut and drill the raw material into their required lengths in a largely automated process assisted by the StruM.I.S software nesting and production routing features to further assist in managing purchasing and stock control hence reducing overheads and waste material. Things were slow to begin with until the early 90s where Kiernan Structural Steel received a welcome boost when the Government introduced grants for farmers wanting to build new sheds. To cope with the extra demand, the Kiernan’s expanded their existing premise and hired their first employees. With added capacity, a broader skill-base and the experience gained from working on smaller projects, they began to target the wider construction sector. In the mid 90’s, the couple bought their first automated sawing and drilling CNC machines. “It was a huge investment” said Frank Kiernan. However, it proved to be a wise decision by significantly increasing their productivity and enabling them to undertake even larger projects. Kiernan Structural Steel also invested in StruM.I.S – a steel fabrication management system enabling them to be efficient in their steel fabrication. StruM.I.S integrated well into their steelwork fabrication, providing traceability and real-time piece status tracking to ensure successful project execution ultimately displaying significant cost & time savings. “Our staff are highly skilled, many have been working with us for up to 20 years,” says Frank. “While we are a family-owned and family-run company, everyone has a real say in how the company is run,” he insists. 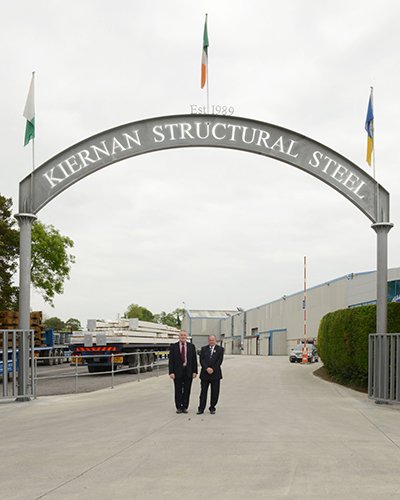 The story of Kiernan Structural Steel is a real example of how one couple managed to turn what could have been a bleak future into a hugely successful one through their own hard work and investment in the right technology enabling ROI. AceCad Software will be attending the SteelFab 2013 exhibition, 14 – 17 January, 2013, Expo Centre, Sharjah, United Arab Emirates. SteelFab 2013 is the biggest display of steel fabrication machinery and associated engineering products in the Middle East and it is a must visit if you are engaged in the structural steelwork sector. SteelFab 2013 is an opportunity for you to find out about new and advanced steelwork solutions and this year it will also deliver knowledge about the latest trends in the steelwork industry through practical seminars. Steven Watson, Sales Manager at AceCad, will be delivering an informative presentation on advanced software technology for efficient steel fabrication on 16 January 2013 at 10.30 – 11.15. This presentation will focus on how our advanced software products deliver centralized control and project insight for efficient management of steelwork fabrication. AceCad will also be exhibiting on stand number 182 and welcomes any delegate registered/attending SteelFab 2013 to drop by to see us, where our sales representatives will be demonstrating live our solutions for efficient structural steel fabrication management. Our Middle East team will show you our StruM.I.S system for larger and medium sized steelwork fabricators together with our new Essentials solution for smaller fabrication shops. We hope that you avail this opportunity to join us to discover our Building Information Modeling (BIM) collaboration software BIMReview and introducing BIMProject our brand new construction lifecycle management software for procurement and construction teams. 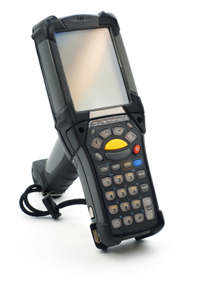 Bar code data-collection systems provide huge benefits during the manufacturing and processing stages of fabrication. Murray & Roberts subsidiary company, Genrec, has extended these benefits further by tracking individual items within large scale projects. The bar code data-collection solution enables faster and more accurate data capturing with lower costs, minimised mistakes and easier data management through the StruM.I.S system including site materials and piece tracking. With Genrec’s principal RSA steel fabrication site in Wadeville, covering over 55,000m2 of undercover workshops and open areas, tracking of materials and fabricated items represented a major issue. As StruM.I.S users they had already decided to extend shop floor feedback automation through bar coding for an optimised workflow and real time tracking. This implementation has been highly successful for quite some time and has shown real benefits in terms of processing steel through production efficiently and gaining the most out of the management system; StruM.I.S. Following successes in several large projects around the world, Genrec has become the main contract steelwork fabricator for a substantial domestic infrastructure project. This resulted in the need to develop their own onsite fabrication facilities alongside the creation of a lay down storage area covering an area larger than that of five soccer pitches! The sheer size of this storage area created a number of traceability issues for both raw materials and fabricated items and as such Genrec approached AceCad to see if it was possible to create a way of implementing bar coding through StruM.I.S into a new onsite process to enable complete onsite traceability. Following development work between Genrec and the AceCad team, StruM.I.S is now able to use the bar code tracking functionality through a specially designed interface to track all site movement of materials and fabricated items. Originally, the brief given by Genrec required the ability to scan items into the Production Delivery notes to define that these items were leaving the fabrication facility and headed for the site. Once the shipment is received at the site, the items are then scanned again as a confirmation of receipt to ensure that they have not been lost during transit. On confirmation, StruM.I.S will recognise the location, including GPS coordinates, for easy onsite traceability throughout the entire construction process. You can now optimise your steel procurement with StruM.I.S – More accuracy, reduced waste, costs savings! StruM.I.S integrates your structural steel procurement with live contracts and enables the management of suppliers, with pricing and nesting automatically completed and all costs allocated for analysis. 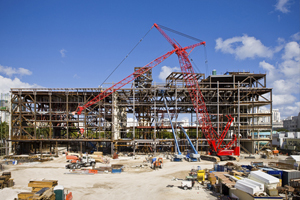 Structural steel construction businesses need to purchase wisely and efficiently to deliver successful returns. The structural steel purchasing function is critical and often complicated by multiple simultaneous project requirements. StruM.I.S allows the management of suppliers and integration of purchasing for more accuracy, less waste and ultimately to save you money! Materials Classification, facilitating CE compliance, returns, damaged goods, etc. How much money do you want to spend on the software? 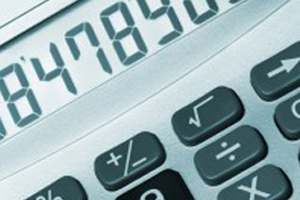 Ideally, you should conduct a cost-benefit assessment. Analyse what you really want to get out of steel management software and ask yourself, do the long-term benefits of such software reflect or outweigh the initial investment? Buying steel management software is a long-term decision and switching costs could be significant. Select software that is widely used, good value in terms of cost and functionality, and flexible enough to meet your business’s current and future needs. Your new steel management software will need to work with as many of your current (and future) software and hardware products as possible. Does the software need to integrate with your production machinery? Will you be using consoles or bar coding on your shop floor? What about the workflow with your existing front office systems? Does the software use reliable technology platforms and will it integrate with your existing infrastructure? Time is money so when you’ve made your choice, the quicker you can get your new software in place, the better. Try to select a steel management software vendor with local representation if possible, or that can offer fast and efficient implementation online for maximum early benefits. Make sure that apart from the implementation of the software, you are given the opportunity for appropriate training. Is it important to you where your training takes place? Are there implementation documents or videos available and does the company have experienced trainers knowledgeable in your industry? 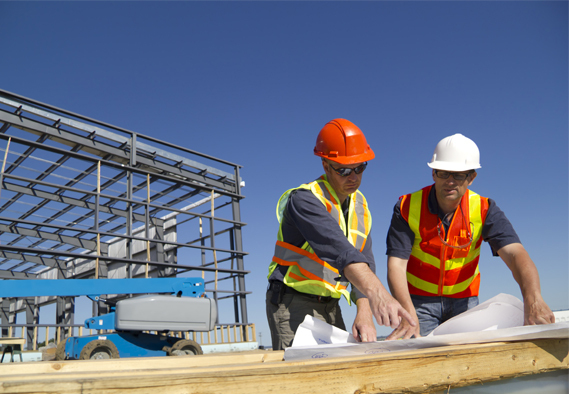 What functionality do you need from the steel management software? What would you like the software to do for you? Draw up a list of desirables and see which software can fulfil them. Perhaps supplier analysis is important to you in your materials purchasing? Is revision management something you need to consider? What production control functionality is offered? Is integration with CNC machinery important? Check out what’s on the market and see what each piece of software does – there may be features available that you didn’t know existed. It is also useful to evaluate the ease-of-use of the software. Does the software supplier offer demonstrations or a trial period? Your steel management software should not only provide maximum value-for-money but also be capable of providing you with immediate and rapid return on investment. Will you see visible savings from reduced time, materials savings or processing efficiencies from the outset? Determine how you will measure the success of the software and ensure that you monitor this regularly. 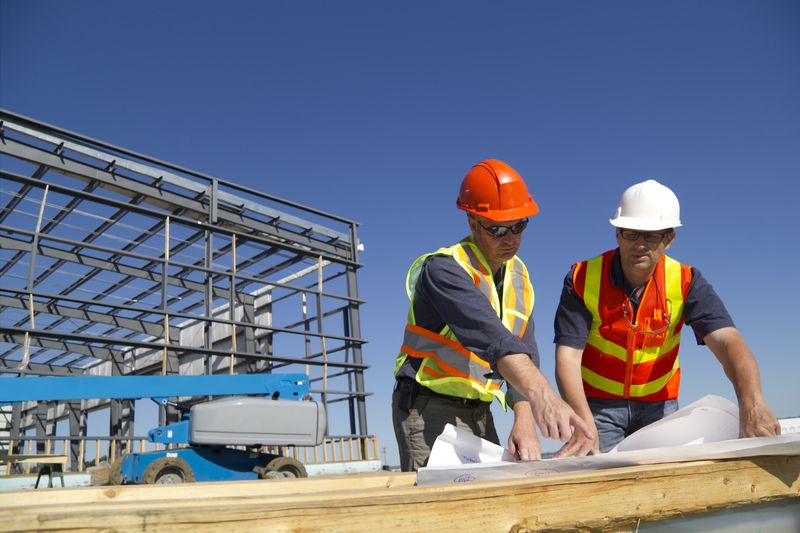 Will your steel management software package include technical support? How will the vendor provide this support (e.g. telephone, e-mails, extranet, dedicated helpdesk)? Work out what times of day you are likely to need support. It can be difficult to guess how much technical support you will need but one thing’s for sure, you will need some help initially and will want to be reassured by the level of support offered by your chosen vendor. We actually think our own steel management software is quite good… If you want to see whether it fits your requirements then grab your checklist and click HERE! Heard about CNC Feedback Timings? CNC machinery automates many fabrication processes but imagine if you could accurately track the fabrication time that was spent on individual tasks, providing all of the relevant data that you would need to accurately provide a bid for future jobs. Imagine if you could do this automatically within a system! Making the task much simpler and easier to monitor and track production. The StruM.I.S fabrication management system integrates with leading CNC machinery to deliver accurate automatic processing feedback timings to incorporate into future estimates. 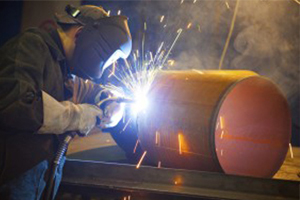 Thereby enabling fabrication companies to get ahead by understanding the resources available and true costs for accurate tenders at competitive prices, whilst still ensuring adequate profits are created. Agen Judi Bola on Essentials: A Roaring Success!